Did you know that Environment and Sustainability Committee does more than advocate on regulatory issues ranging from permit requirements to pushing for our collective voice to be heard on groundwater sustainability? We also lead the annual environmental cleanup event, helping our Chapter earn the APWA Presidential Award for Chapter Excellence (PACE). We are pleased to host the newest edition of American Pickers…Adopt-A-Highway style. We made a minimum two-year commitment, twice a year, to clean a short stretch of Highway 100, between the 36th Avenue and Bottineau Boulevard interchanges in Robbinsdale (https://goo.gl/maps/ZKFeXxZ1Ai72). Let’s help do our part to keep our lakes, rivers, and wetlands free from pollution. 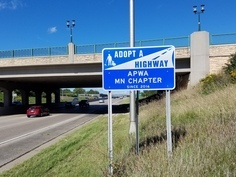 Our APWA-MN sign is now up, so we better pick up! Join us on Thursday, October 13, at 1 p.m. in the Cub Foods parking lot at the intersection of 36th Avenue and Highway 100 to kick-off the event. Event coordinators will review safety precautions with the group and split volunteers into two teams to clean up each side of the highway. Materials for the event will also be provided – just show up and join the APWA Environment and Sustainability group in taking care of our community! We encourage all volunteers and members to join us immediately after for a social hour at Wicked Wort Brewing Company (4165 W Broadway Avenue, Robbinsdale). We understand that a local official may have visited all nearby sites, and this one rose to the top. Please contact committee members Matt Huggins (matthew.huggins@kimley-horn.com) or Mike Ryan (mike.ryan@hdrinc.com) to sign up. All volunteers will be contacted prior to the event with safety information to review.